This week, we have been blessed with incredible weather! With it being almost 90 degrees outside every day, Arayot has been having a blast in the sun. Don’t worry, we also follow our mayim-creme haganah-kova mantra (water-sunscreen-hat). Shabbat was meaningful and relaxing, as usual. Because it was our penultimate Shabbat, we have been making sure to soak up as many memories as possible. On Sunday, we started our day with delicious Rosenfeld’s bagels and had our our normal schedule o f schiah (swimming), chug (actitivty) and kitah (class). In the afternoon we had, yom yarok (environment day), which was our chesed (acts of lovingkindness) project. The chanichim (campers) learned about how to make camp more environmentally friendly. We talked about what is supposed to be going into compost, recycling, and trash cans. 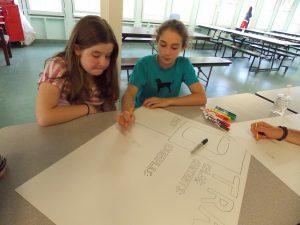 We then made a PSA video for camp and posters to go into the chadar ochel (dining hall) to remind everyone. We ended the night watching an incredible arts festival performance. Shout out to Sophie G. for an outstanding performance on the silks and Marty S. for working day and night on the lights for the performance. Last night we spent the night outside pitching tents, BBQing, making s’mores and by doing erev (evening) prison break. It was an overnight filled with bonding, eating, and much stargazing! !